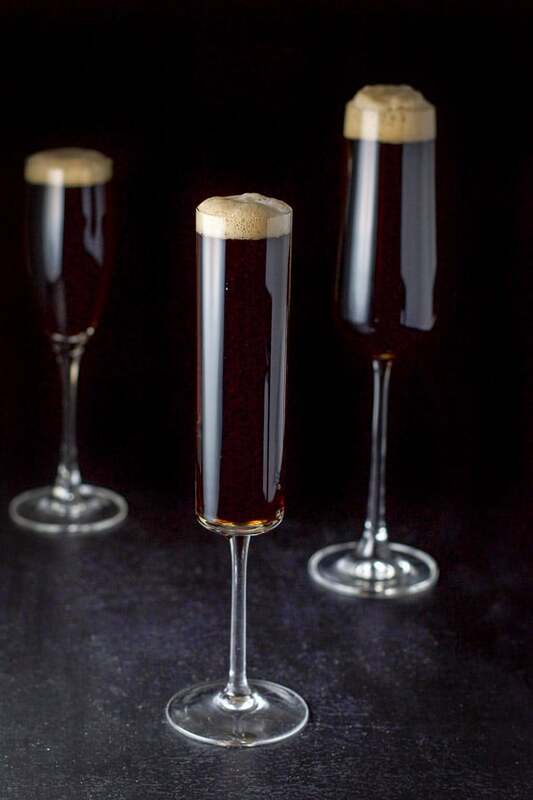 This Guinness red velvet cocktail recipe is a delicious balance of Guinness beer and champagne. 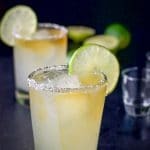 It’s also a perfect cocktail for celebrating Valentine’s Day with your sweetheart! Does this red velvet cocktail taste exactly like the cake or cupcake it is named after? No (although the color is close). But not every cocktail tastes like the food that gives it its name. 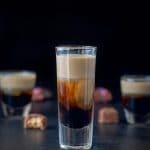 One standout cocktail/shot that tastes pretty close to the food it was named for is the chocolate covered cherry shot. Man, oh man, is that delicious! 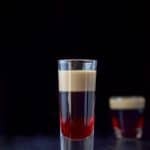 This red velvet cocktail is easy to make because it only has two ingredients. They blend together nicely to make a smooth and satisfying drink. 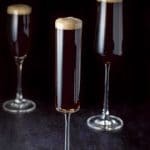 Some folks don’t care for the bitterness of Guinness beer, but I say the addition of champagne mellows out the bitterness and balances out the drink. 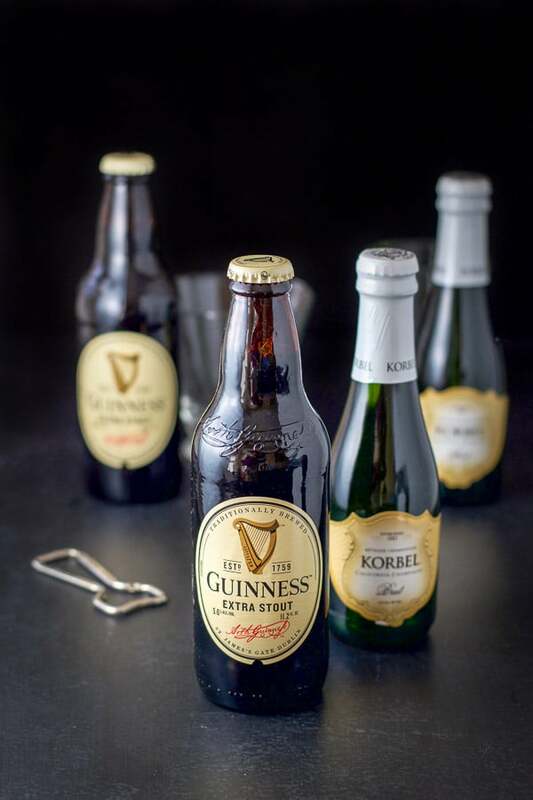 Gather the ingredients – Guinness stout beer and brut (or extra brut) champagne. 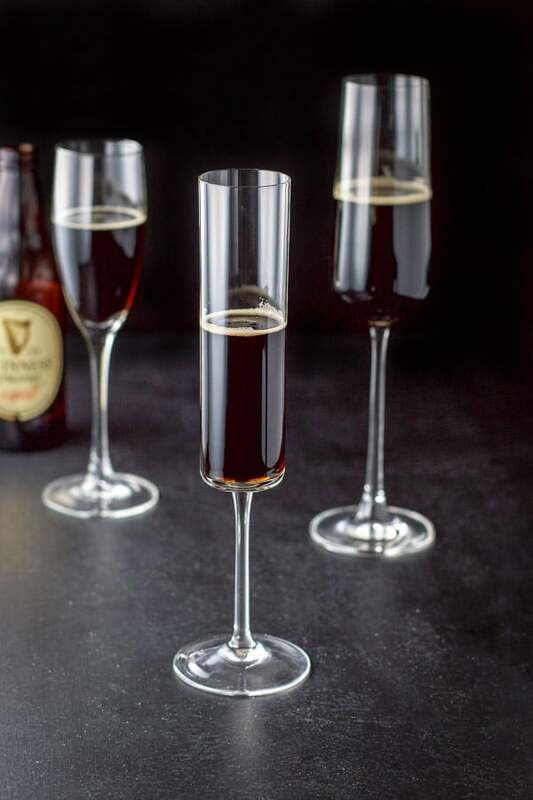 Get a champagne flute and open the Guinness. Tip the flute and slowly pour the Guinness halfway up the glass. As you can see there isn’t much of a head after pouring the beer. That is what you are going for. 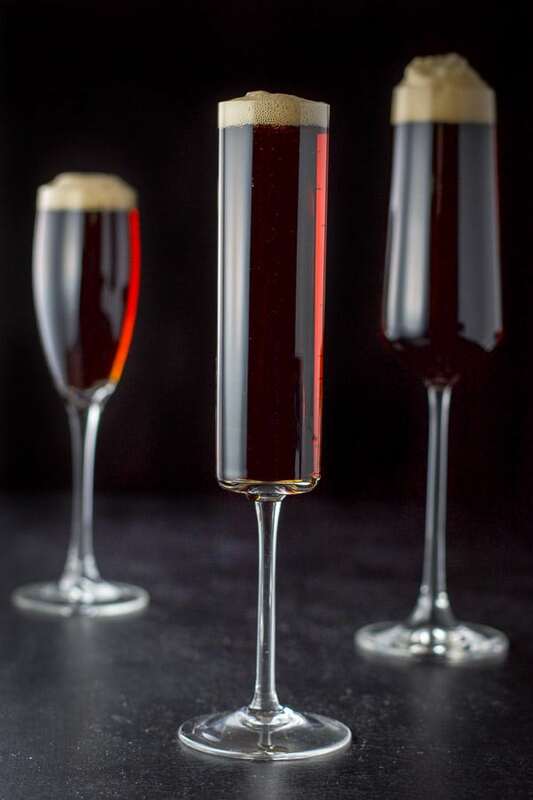 Open the champagne, tip the glass until the beer is near the top and slowly pour the champagne in the glass. As you pour, you will be straightening the glass as the liquid fills the glass. It is preferable for there to be a head (of foam) at the top of the red velvet cocktail. Usually when I photograph my cocktail recipes, I only have one light on to take the photos. With this recipe, I put two on so you could see the beauty of this red velvet cocktail. Notice the pretty reddish color. Let’s see the cocktail without the champagne bottle in the background. And since it takes a little while to take photos, I was losing the head on the cocktail, so I added more champagne to rectify that. Look at the back right photo. Woohoo! And now for the vertical view. 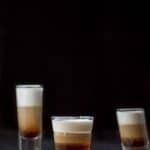 I hope you enjoyed this Guinness red velvet cocktail recipe. And as always, may all your dishes/drinks be delish! If you’ve tried this Red Velvet Cocktail recipe, I’d love the know what you thought about it in the comments below. I love hearing from you! You can also FOLLOW ME on FACEBOOK, TWITTER, INSTAGRAM and PINTEREST to see more of my delicious food and delightful cocktails! The two ingredients in this delicious cocktail balance each other out and make for a tasty cocktail. 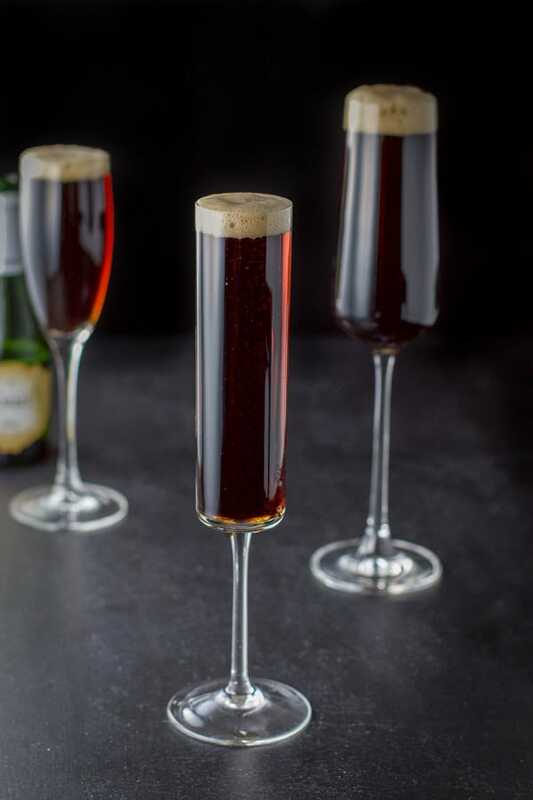 The measurements of the ingredients are approximate as all champagne flutes are different sizes. Just go with half Guinness and half champagne. This looks dark and delicious! This looks so cool and fancy! I love how you photographed it so we can get a view of that red color. I might have to show this to my girlfriends! Thanks Carmella! I appreciate it! I’ve never had a beer/champagne combination before! Definitely a must try ! The red color is gorgeous! Lauren, it’s kind of a weird combo isn’t it? But it works. It works really well! I hope you do give it a try. What a fabulous idea, it sounds really good. I’ll have one please. That is an eye-catching cocktail; it definitely paid off to have that extra light in the shot. Good thinking. What a great cocktail idea! I can’t wait to make it for my friends this week!! Thank you! Another delicious cocktail to add to my collection! I love how easy this one is, will be great for Valentine’s day! Thanks Patty! 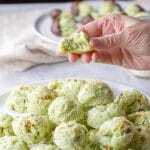 I was skeptical when I first heard about it, but it is delicious and satisfying.